TUCSON — When he lived in the Valley, Tucson Mayor Jonathan Rothschild had a front row seat for the growth of hockey in Arizona. 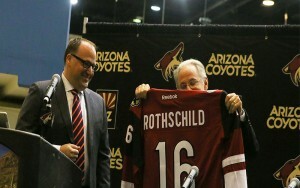 And Rothschild hopes that hockey’s surge will continue in Tucson with the move of the Arizona Coyotes’ American Hockey League team to the city. The AHL is the final minor-league step before players make it to the NHL. Hockey in Arizona continues to grow at a rapid pace. The state experienced the second highest growth rate of registered players in the nation in 2014, trailing only Oregon, according to USA Hockey’s participation numbers. 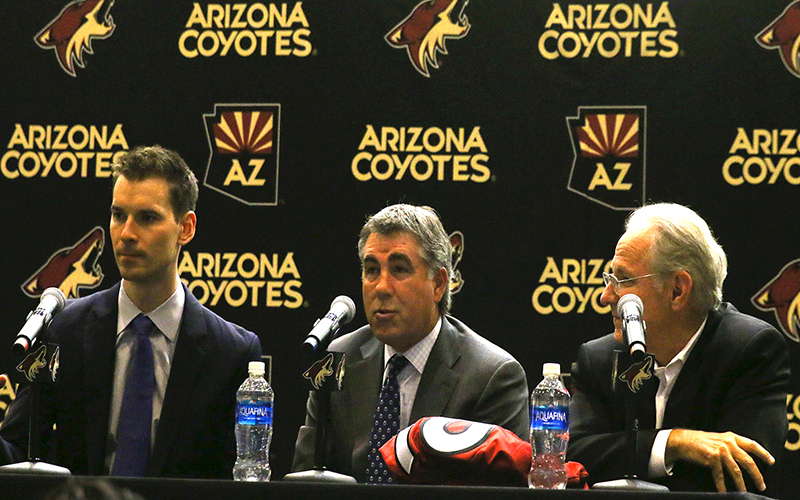 Coyotes President, CEO, Anthony LeBlanc said he believes hockey will thrive in Tucson. “We’ve done our research: tens of thousands of fans in Tucson buy tickets to go and watch the Coyotes play,” LeBlanc said at a press conference last week after the AHL’s Board of Governors unanimously approved the move of the team from Springfield, Massachusetts, to Tucson as well as transfer of ownership to the Coyotes. LeBlanc is hoping to mirror the success of the San Diego Gulls, the Anaheim Ducks AHL team that debuted this past year and drew an average of 8,700 fans per game, trailing only the Hershey Bears in league attendance. The team’s move to Tucson is just the latest sign of the sport’s popularity in the state. Arizona State’s men’s hockey team made its Division I debut in the past year. A Division II women’s club team will make its first appearance for the school this fall. Scottsdale’s Auston Matthews, who grew up a Coyotes fan, is projected to be the top overall pick in next month’s NHL Draft. Matthews has been making a name for himself in Europe and for the United States at the World Championships this spring. The University of Arizona’s club team also had a lot of success in Tucson this year, drawing nearly 27,000 fans over the course of the season. UA and the Coyotes AHL team will share the ice at the Tucson Convention Center, which underwent renovations in 2014. The convention center is the only sheet of ice in the city, but LeBlanc said he hopes to see more develop now that a professional hockey team will be in town. The organization is hosting a contest to name the team, although a few fans gave some suggestions, yelling out “monsoons” and “roadrunners” as choices at the news conference. LeBlanc said the organization hopes to sell tickets that would range from $10 to $40 with the average price being about $15, which is less than the AHL average of $18. Coyotes General Manager John Chayka said that having the AHL team close by in Tucson will be beneficial to the organization.